Call us anytime, "We have your solution"
MITSUBISHI ANNOUNCES SILVER DIGIPLATE MATERIALS INCREASE 8% EFFECTIVE MAY 1st! 6 Pk Chemgon 5 Gallon FREE SHIPPING! Chemgon Film and Poly Plate Chemical Disposal! Laser Clean Ex-ORIGINAL FORMULA!! GUARANTEED RESULTS! Pressman's Pride Hand Cleaner 8 x 4.25# Tubs THE ABSOLUTE BEST HAND CLEANER AVAILABLE, HANDS DOWN! 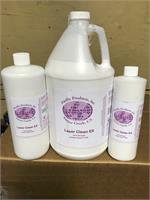 The absolute best cleaner available, hands down! Your Price: Chemfree plates coming soon! Looking for mid-size metal platemaker with impeccable quality? This is THE machine for you! !